Mickey Charles Mantle was a baseball player. He was born on October 20, 1931 in Spavinaw, Oklahoma, and died on August 13, 1995 in Dallas, Texas. He was a Major League Baseball (MLB) centerfielder and first baseman for the New York Yankees for 18 seasons, from 1951 through 1968. Mantle is regarded by many to be the greatest switch hitter of all time, and one of the greatest players in baseball history. 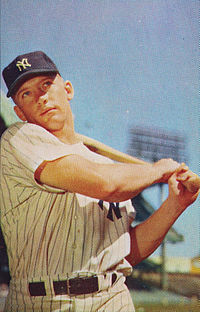 Mantle was inducted into the National Baseball Hall of Fame in 1974, and was elected to the Major League Baseball All-Century Team in 1999. He received numerous honors and awards over his lifetime. This page was last edited on 5 March 2019, at 01:15.